(Dan Trimmer, 2000). ((Unknown x Wedding Band) x Tetra Dragon’s Eye) Tetraploid (Sdlg. 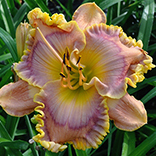 96-36) 30” 4 ½” Evergreen, M. Re CUBAN SKIES is a dark peach bloom with a very dark intense purple eye and wire edge with yellow green throat. CUBAN SKIES with a typical budcount of 20 is fertile, vigorous and another of the very distinctive offspring from TETRA DRAGON’S EYE. What I like so much about many of the DRAGON’S EYE kids are the very large bold eyes that covers so much of the face. 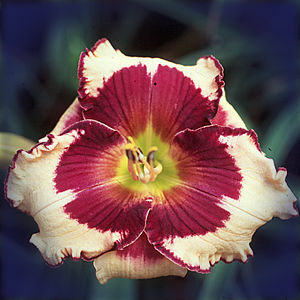 I also like the fact that CUBAN SKIES’ purple eye does not bleed into the petal color, but is bold and sharp.